A RwandAir's B737-500 at Kigali (Rwanda), in 2011. East African Spotter. 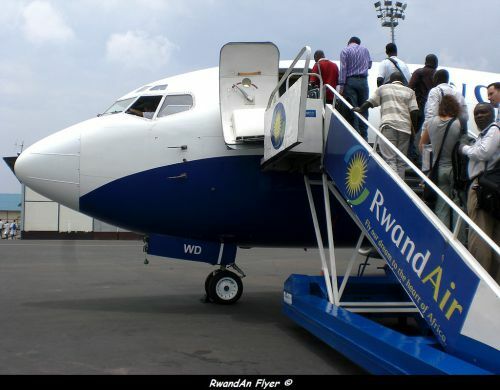 According to Amadeus (13 DEC 2011), from 15 DEC 2011, RwandAir will fly to Entebbe with B737s (500/800(102 seats-154 seats)), every thursdays evening. The 737 replaces the CRJ-200 (50 seats). The daily morning flight is still operated with the CRJ or the Dash (37 seats). When it's 21h00 in Rwanda, it's 22h00 in Uganda. Effective from 15 dec 2011 to 29 DEC 2011. Kigali-Gisenyi flights temporarily suspended, in January 2013 ?